I would love to be on the cover of the book about G.I. 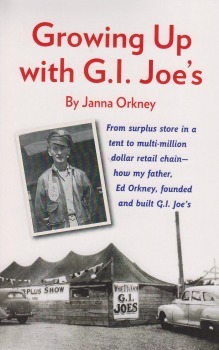 Joe’s history, but since the book is mainly about Dad and the growth of the store, it is hard to justify that. So, while I do like the photo of my four or five year old self sitting on the hood of a Buick as I hold my doll (either Pamela or Veronica…I don’t know which because they looked alike), that I have shared on this blog, Dad does seems a more appropriate focus for the cover. Designer Susan Wells came up with this possibility for a cover. I like it, but want to see other designs, too. I don’t know why it looks slightly crooked, because the text looks OK in person. I like this cover–and it’s nice to have the picture of your dad front and center.